The quintessential Oliver Ditson vocal anthology is now available with piano accompaniment CD! Since its publication in 1928, Art Songs for School and Studio has long been the jewel of vocal pedagogy. 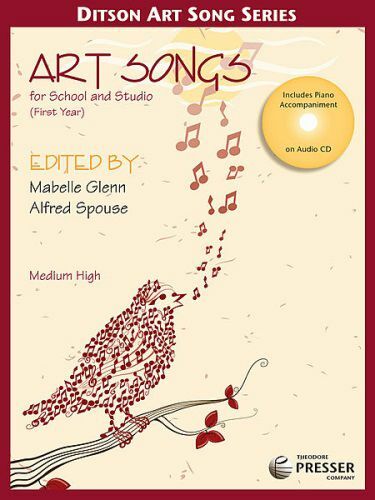 Edited by Mabelle Glenn and Alfred Spouse, this collection is published for the first time alongside an accompanying CD, sure to delight vocal teachers everywhere! With piano accompaniments to the book's 25 pieces performed by Rae Moses, now teachers and their students can play the CD, sing along, or use it to practice alone. From Schumann's "Lotus Flower" and Strickland's "Road to Home" to Purcell's "Passing By" and the Old English Air "When Love is Kind," Art Songs, now with the addition of an accompaniment CD, will continue to endure as a cherished vocal anthology for many more years to come.